Food program is terrible. Liquor choices were below par as well. When I go on a PAID vacation, no freebies, deals, etc. and get harassed for a time share purchase it's kind of a downer. Now Onyx at Punta Cana is a time share pushing racket. Even when you tell them 'no' they persist. Once it's clear that you won't give in, the quality of service goes south quickly. Nice hotel, close to the beach and several pools. Good food and good bartenders. The only complaint is the safe in our room was locked when we arrived. It was opened but we continued to have lockout problems. The staff is very honest, safe problem not the staff. Great staff, plenty of good food and drink. The beach is clean with a sweeper always grooming the sand. Now Onyx offers exclusive treatment, even to those who have reservations will be excluded until they get escorted in by security. We decided to reserve a room after being informed we would have to pay to attend our friends' wedding and leave after the reception. Our friend was not informed of this either, until a few weeks before their wedding and after we booked our beautiful tranquil B&B nearby. We walked with our backpacks along the beach and were not politely stopped while attempting to enter via the beach to check in. Despite informing security that we had a reservation, we were treated as if we were intruders, and made to wait with our bags on the beach until the supervisor came. Neither the staff nor the supervisor cared to look at our reservation, nor did they apologize for the treatment or the delay (we lost the time to prep for the wedding and ended up rushing to get ready on time for the ceremony) only being told that it was their policy we couldn't enter from the beach. Be warned if you intend to go to a wedding there without staying there. Perhaps an unique situation but worth noting. The resort is a resort like any if that is what you are looking for. Too much food, too much noise, too many people many pools. It is an expansive resort. There's much more to see beyond the resort life in DR. Not a good value for a one night stay, but if you have kids and don't ever want to leave the resort then this is the place for you! PS- the bar staff was great! Would we stay here again? We typically avoid going to the same resort twice just because we want more experiences but, we would stay here again. The Now Onyx is a perfect family, couples, or singles hotel. The food was great and yes, predictable but I knew where to find the foods I wanted any time of day. Resort size – Smaller than the norm which is great for those with mobility issues. Everything is w/c accessible. Also, you can call for golf cart transport if needed. Breathless resort (adults only) is linked to Now Onyx so you get access there as well. Rooms – We opted to upgrade to the preferred club (PC) swim out rooms ahead of time via the eConcierge. I highly recommend doing this although they are not true swim out but direct pool access. We arrived to be whisked off to the PC desk with specialized attention. We were given amazing rooms next to the main pool within walking distance to beach, lobby, and restaurants. Double/full size beds were too comfortable. Easy to sleep in and take naps! Had tons of pillows (8) on my bed which made it even better. This was our first trip (out of more than 30) to Caribbean where our room was TOO cold. We requested extra blankets but kept it set at 20 C.
i totally recommend staying at this resort especially for families. The staff were AMAZING. I would like to give a special shoutout to Julia Aka Julia Roberts by the pool bar. Very friendly server and very attentive. The hotel is very new therefore everything about he resort is good so far. The only complaint I have is not a lot of selections of different foods in the buffet. The food in the buffet can feel very repetitive other than that, I really enjoyed my stay at the resort. Excellent hotel, but should improve food...nice beach and have many pools! Very nice hotel, beach is close, the service was pretty good. The buffet was very good, the other restaurants not so much. The room was nice, although the picture is misleading. When I booked a swim-up room I assumed it would be like on the picture, we would have our own pool. But I am guessing that picture is meant for the preferred club. Our room did have a pool right outside but it was long pool that was shared between us and our neighbors. Which is fine. Just a bit misleading. The room service was ok, although when we ordered breakfast one day, we were told it will be there in 20 min, we waited over 45 min. Also the first night that we got there, my husband's flip-flops went missing right from the patio area. Also, one day they had allowed vendors to come in and set up their tables around the hotel and that was very annoying, every time you were walking by, they all tried to sell you something and tried to put on necklaces on you and stuff. We did enjoy the performances every night. The drinks at the bars were decent. Overall, the hotel was pretty nice. I would still recommend it. This resort caters more to families than adults. We were booked into the family side instead of the all-adult portion by our travel agent. As a result, our room was noisy being on the main pool side. We asked to be changed, but we did not receive any communication on this request. Our butler was inconsistent in his availability and did not seem to hand us off to someone else when he was off. We've stayed in many other resorts in Punta Cana and would recommend trying other places. The preferred club service level at this resort allows families with children in the clubs. Other resorts do not do this. Poolside service was spotty or nonexistant when there were activities going on at the main pool (which happens 75% of the time). Our room had dirty linen and damaged furniture that we pointed out on the first day but we it was not addressed. The restaurants are not all open every evening and the schedule is posted only outside the restaurants. We thought we had reservations made through our butler, but found out they weren't made and had no room. Overall, we would go elsewhere. We stayed for 5 days at Now Onyx in the first week of May. We had a fantastic time. There was a giant storm 2 days before we got to the resort which was apparently devastating to the resorts. Resorts up and down the beach lost power, had no dinig services and had to drain their pools! You would have never known at Onyx. Everything was perfect. The resort is very clean and modern but at the same time it blends beautifully into the island. Our room was gorgeous. We upgraded into The Preferred Club and upgraded our room as well. The rooms were beautiful and clean. The only reason I did not give 5 stars was because though the rooms were not warm at all, they often felt damp. And twice I had to ask for Housekeeping to clean our room VERY LATE in the day. But the beds were comfy. They had great tech in the room. And the minibar was nice (it included candy and Pringles!) The service was wonderful here! Everyone was lovely. Our butler, Kyana, was fabulous. Also, by the Preferred Club pool the staff was great...especially Andres and Julia. The buffet had amazing choices with something for everyone. The best fresh juices...The restaurants were about standard for an all-inclusive (no complaints!) Also, the Preferred Club Lounges are a really nice touch and worth the upgrade. I can't wait to go back! The resort was clean, the beaches were well maintained, the staff was friendly, the food was great (minus the room service meals...yuck), and the drinks never stopped! We upgraded to Preferred so we enjoyed premium drinks, private clubhouses with AC and butler service. We left right before spring break which is when it got packed!! Not too big and not too small. Everyone's close to the beach. You have the quiet relaxing adult side and party kids side. The only thing that stunk is that the stairwell was in middle of building. So all the end rooms can't just walk down stairs on end. Had to walk to middle every time and then back around building. Food wasn't the best but the resort was!! The hotel was great, the staff at the hamburger place is excellent. The only issue that i have is that in the website they advertise that you have full access to the Hotel Breathless, but the employees at Breathless are not aware of this and believe that the full access is only from 6:00 pm onwards. Now Onyx Punta Cana All Inclusive places you 5.9 mi (9.5 km) from Macao Beach. This 502-room, 4-star property welcomes business and leisure travelers with 5 outdoor pools, a full-service spa, and a casino. Free buffet breakfast is served each morning from 7 AM to 10:30 AM. This property is home to 5 onsite restaurants, perfect for a quick bite to eat. Savor a meal from the comfort of your room with 24-hour room service, or get a quick energy boost at the coffee shop/café. Guests can expect to find free WiFi and 32-inch a flat-screen TV with cable channels. Beds sport premium bedding and the bathroom offers a rainfall showerhead, a hair dryer, and free toiletries. Other standard amenities include a balcony or patio, an iPod dock, and a sitting area. 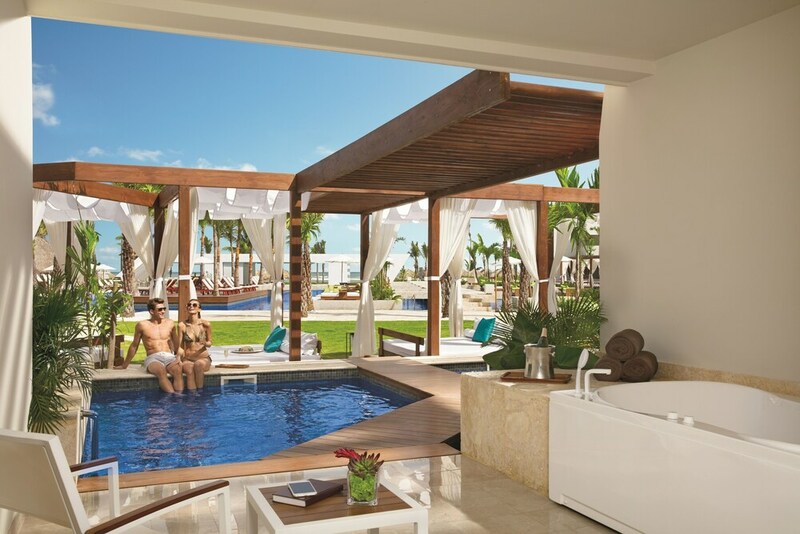 Now Onyx Punta Cana All Inclusive features a full-service spa, 5 outdoor pools, and a casino. You can take advantage of free valet parking if you drive. The 24-hour front desk has multilingual staff ready to assist with concierge services and luggage storage. Other amenities at this beach property include a nightclub, a children's pool, and a health club. Free buffet breakfast is served daily from 7 AM to 10:30 AM. Now Onyx Punta Cana All Inclusive features an outdoor tennis court and a health club. The property has 5 outdoor swimming pools and a children's pool. The preferred airport is Punta Cana (PUJ-Punta Cana Intl. ): 38-min drive, 25.7 mi/41.4 km. This offer is valid for 1 evening only per stay. Participating resorts: Dreams Dominicus La Romana, Dreams La Romana Resort & Spa, Dreams Palm Beach Punta Cana, Dreams Punta Cana Resort & Spa, Sunscape Bávaro Beach Punta Cana, Sunscape Dominican Beach Punta Cana, or guests over the age of 18 have access to next-door Breathless Punta Cana Resort & Spa. Guests must contact the selected resort’s concierge in advance to make arrangements by 3 PM on the day guests wish to visit the partner property. Contact the selected resort for additional information or restrictions. Transportation is not included. Guests are responsible for round-trip taxi fare and all gratuities. Valid anytime, subject to availability. Details at check-in. Other restrictions may apply.